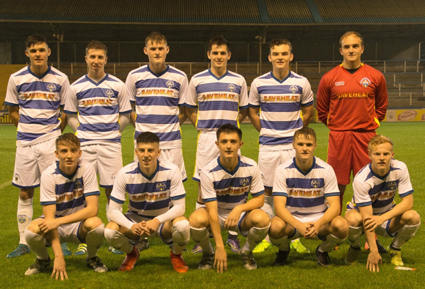 Darren Barr’s Under-20s proudly took to the field for last night’s Development League West match in brand new home kits courtesy of sponsors Blairs Windows, which is part of the Saveheat Group. The team unveiled the strip, which features the company’s logos on both the front and along the shoulder blades on the reverse of the shirt as well as the shorts, prior to Wednesday’s 1-1 draw with Queen’s Park. This brings the development squad into line with the first-team in wearing the pin-stipe hooped shirt produced by Vision, and we thank the Saveheat Group for making this possible with their invaluable financial backing.